A narrowing US Treasury 10-2yr spread can be an early warning sign that the American economy is headed for a recession, but we don’t believe recent dynamics reflect this outcome. Domestic and global quantitative easing (QE), financial regulation, and low inflationary pressures are keeping the spread lower than it would be otherwise. For this reason, it is the term premium causing the flattening and not expectations for a monetary policy error, which is different from historic observations. By our estimation, the UST 10-2yr spread conveys a probability of a recession occurring within the next 12 months to be 20-30%. But, when we adjust for the presence of QE, it reduces that outcome to 5-15%. One should not look at yield curve dynamics in isolation. When appropriately combined with other leading economic and financial variables, the message is further reinforced that the U.S. economy still has room to run. There is considerable media discussion surrounding the relative flatness of the U.S. yield curve. With the UST 10-2yr spread at approximately 60 bps, the lowest level in a decade, is it time to sound the recession alarm bells? In short, no. Yield curve compression is certainly a valid and early-warning signal of recession risks, but it’s premature to sound the alarm. To understand why, we examine both financial and economic variables to get a better idea on how far away we are from recession. 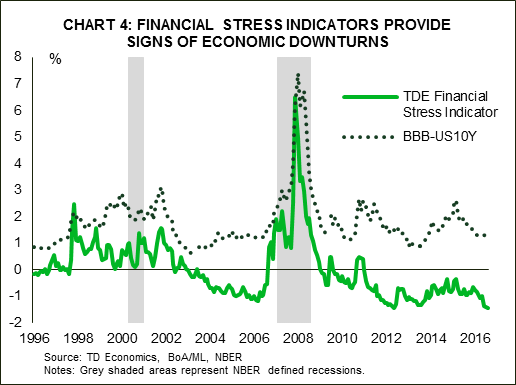 First, it’s important to distinguish the reliability of recession signals offered by yield inversion versus compression. A recession has typically been preceded by an inversion in the yield curve (Chart 1). Clearly, before we hit the stage of inversion, compression must first occur, and various researchers have tried to identify meaningful thresholds that either increase the odds or are a precursor to a looming recession. One such report came from the Federal Reserve Bank of New York, “Monetary Cycles, Financial Cycles, and the Business Cycle”. This paper is grounded in a supply-side notion that flat yield curves create conditions that affect bank profitability, bank lending, and subsequent real economic activity. In this paper, the authors use the UST 10yr-3m spread and state that a level below 93 basis points (bps) predicts an increase in the unemployment rate. In turn, this is mostly consistent with a recession occurring within 12-18 months. Today’s equivalent spread is very close to that threshold at roughly 100bps. There are many versions of this “spread” warning signal. Some use the UST 30-5yr spread, and others abide by the spread on minimum yield. This latter approach emphasizes the lowest yield on the UST 10yr observed during the cycle against the current 3 month yield1. Applying this exercise, the minimum UST 10yr in this cycle closed at 1.50% during Brexit turmoil in 2016 (the intraday level was lower at 1.32%). This means that a cross could happen after the next one or two FOMC rate hikes. But, this pick-and-choose spread analysis can become a bit of a data-mining exercise, which is part of the point we’re making. It’s important to understand the broader context of yield compression and look at the message that’s also being conveyed from other indicators in order to get a clearer read of a recession signals. In other words, the yield curve is a fairly reliable recession-indicator, but by no means is it perfect, and even when it gets it right, it still leaves much interpretation on the exact timing of a downturn. 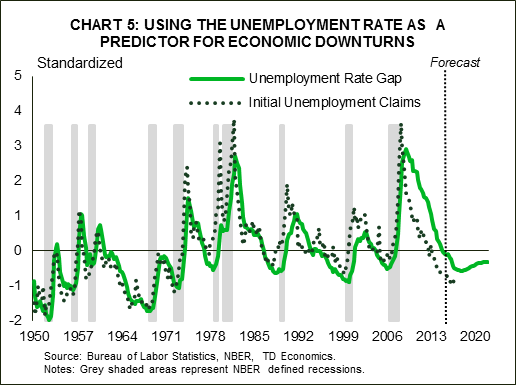 Specifically, there are long lags associated with a recession signal. Over the last three decades, the UST 10-2yr spread hit zero on average 2 years before a recession. If one sold out of the S&P 500 on this signal, they would have missed significant equity market appreciation over the last 3 cycles. 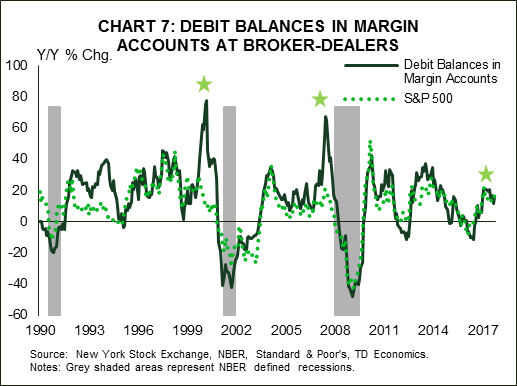 In addition, the UST 10-2yr signal sometimes misses. During the 1957 and 1960 recessions, the yield curve did not invert. In addition, it has provided a number of false/too early signals over the years. Relative to the NY Fed paper, the 10yr-3m (93 basis point) spread threshold has offered false signals (1997, 1995, and 1963). It is important to keep in mind a few important details regarding a flattening yield curve. First, it is a natural by-product of a central bank hiking cycle. As the Fed conducts its rate hiking cycle, it communicates that the path of rates will rise over the coming years. The UST 2yr reflects the average of expected short rates over that period (plus a term premium). The same is true for the UST 10yr over the 10 period. Given the very forward looking nature of the UST 10yr, at the initial stage of the Fed’s rate hiking cycle, that long yield will move up faster than the short end. This generally marks the peak of the 10-2yr spread in a cycle. As the central bank continues to press forward through the rate hiking cycle, the UST 2yr adjusts, hence causing the spread compression. 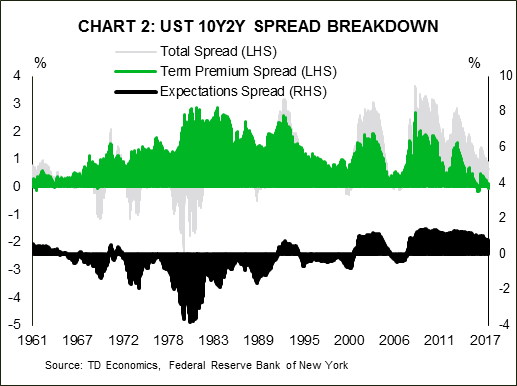 Within our financial forecast, the process of spread compression is not yet complete. We expect a terminal spread of about 35bps, with an understanding that market movements can temporarily push this even lower. What is interesting in this cycle is that the spread between pure market rate-expectations of the 10yr and 2yr are still very positive (Chart 2), whereas the term premium spread is causing most of the compression. Historically, it is the rate-expectations part of the spread that signals recession (ie: a Fed policy error). So, we are witnessing something new with the compression being the result of the term premium. This reflects the influence of QE, regulation, and low inflation. Call these distortional impacts or the new status quo, but in both cases, historical yield curve analysis offers little parallel reference to judge the accuracy of its current predictive ability. There was no previous historical context for QE until this cycle. Adjusting the UST 10yr yield solely for the influence of the Fed’s asset purchases program lifts the yield by 30 basis points or more. Put another way, we wouldn’t be having this discussion on whether narrowing spreads are signalling a recession (Chart 3). When we estimate the probability of a recession using just the UST 10-2yr spread, we find the odds to be around 25-30%, but when we adjust for the presence of QE, it reduces that outcome to about 5-15%. However, this analysis doesn’t take into account the fact that it’s not just U.S. monetary policy actions anchoring down the long end of the curve. Many central banks are engaging in similar asset-purchase activity (BoE, ECB, BoJ). In fact, the Federal Reserve is the only central bank that is truly on a normalization path, marked by four rate hikes and early steps towards balance sheet run-off. The majority of the remaining global central banks are, at best, applying less pressure to the emergency stimulus accelerator. We have written numerous times on the tight correlation of long-term UST to international yields (roughly 70% of the movement linked to global common factors). So, the combined purchases of central banks act as an additional weight on long-term yields, layered on top of the usual influences from domestic policy, increased regulatory demand and, of course, flare-ups in geopolitical risk (cue North Korea). To get a better gauge of risks, we combine the yield curve slope with our Financial Stress Indicator, which captures movements in volatility within equity, bond, and foreign exchange markets (Chart 4). 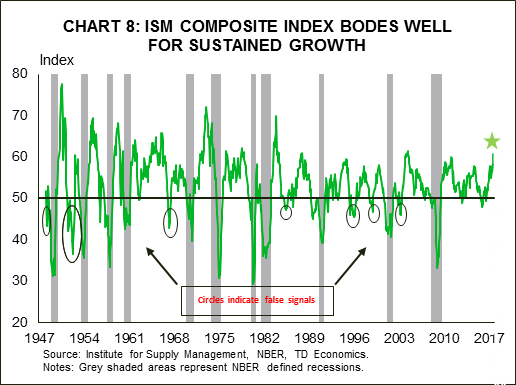 A reading above zero implies a 20% change in the probability of recession and if the indicator moves above 1%, the probability of recession within the next 6 months jumps close to 50%. One reason other financial market indicators have been so strong is because the U.S. macro backdrop is not only solid, but strengthening. Evidence of this can be found by looking at a broad suite of macroeconomic indicators. For starters, labor market conditions have strengthened considerably. 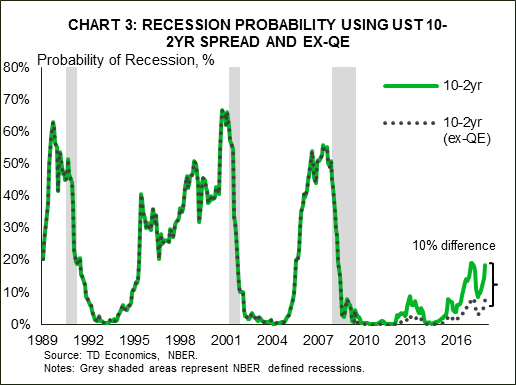 The unemployment rate is below NAIRU and has historically remained there for an average of 3 years preceding a recession. Furthermore, initial claims have continued to trend downwards and have reached their lowest level since 1973 (Chart 5). 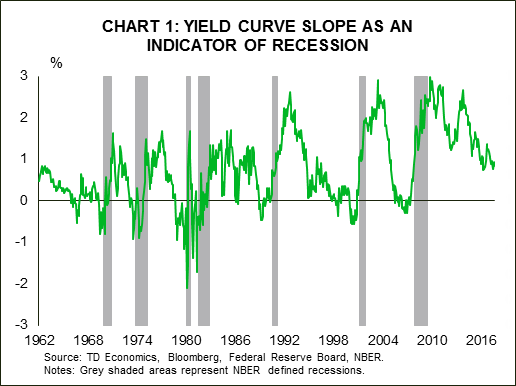 Both of these measures are in our probability of recession models and if they tick up, we will not only receive a recession signal, but it will also give us a better idea on the window of timing. Realistically, a recession risk is always present in any business cycle, so timing does matter. On this front, residential investment also paints a picture of an economy that has room to grow. Since, the late 1940’s, real residential investment as a share of real GDP has peaked about 3 years prior to the onset of a recession. At the moment, the share is rising, but is historically low. Rising wages should help preserve home affordability in an environment of increasing interest rates, thereby supporting American housing market activity. Equity prices are another metric of importance. With the Dow Jones and S&P 500 continuing to make new historic highs, current valuations do give some cause for concern. 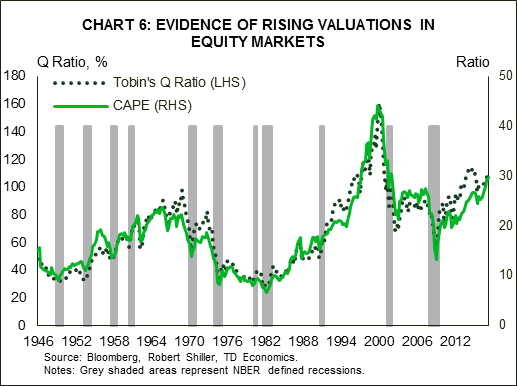 Using metrics including Tobin’s Q and CAPE, there is evidence that equity valuations are flashing yellow, rather than red (Chart 6). The recent gains have been fostered in part by optimism surrounding the ability for corporations to increase earnings in response to the global growth surge, low interest rates, and potentially lower tax rates. In this way, there is some justification for current valuations. Further, investor leverage as measured by debit balances in margin accounts at broker dealers has not accelerated to the point of hubris - something that occurred before previous recessions (Chart 7). Lastly, the production side of the economy also depicts a strong economic backdrop. As illustrated in Chart 8, the ISM Manufacturing Composite Index is clearly in expansionary territory. If this drops to 50 or below, we will have to raise the risk of recession. FOMC: Can they Read the Sign? With the changing of the guard at the Fed, and many seats vacant or being filled, it’s difficult to know their reaction function to a flatter curve. History has not been on their side. During periods when the 10-2yr yield curve inverted, the Fed continued to hike in 1989, 2000, and 2005. Put differently, they ignored inversion as a recession signal. All periods ended in a recession within 2 years. This is often why economists (including us) refer to recessions as being the outcome of policy errors - i.e. the Fed over-tightens relative to the neutral r*, which suffocates growth. However, this time around, we are doubtful that the incoming FOMC will ignore the yield curve signal for several reasons. First, the Fed has been very focused on paying attention to market reaction to its policy and communication. If near-term yields start to price too sharp of a policy path relative to the UST 10yr, you can be sure that the Fed will alter communication to help adjust market pricing. Second, incoming Chair, Powell appears more markets oriented and has not given the impressions of having a dogmatic approach. This, in combination with the changing FOMC composition, their already-cautious policy approach and high media attention, suggests we will see a Fed that proceeds more cautiously to this signal than in the past. If nothing else, a spread that approaches the zero bound would be a market signal to the Fed that inflation expectations are coming down (due to the anchor on 10yr yields). And, during this cycle, we have seen a Fed that’s quite sensitive to the direction and level of inflation expectations. A potential first clue that the Fed is weighing this yield curve predictor more heavily could be another migration down in the near-term part of the dot plot (early 2018), particularly if this occurs against a strengthening U.S. economy and/or fiscal stimulus. Yield compression is a normal late cycle phenomenon, but at 60bps there’s plenty of cushion and it is not yet given a recession signal. The current level of the UST 10-2yr spread is being distorted by central bank policies, both global and domestic. The spread is low because of the term premium rather than pure expectations for policy rates (the opposite of what we have seen historically). The Fed will likely be sensitive to the shape of the yield curve and adjust communication and policy according to the risks it’s conveying.